Indiana is a very important player in the domestic melon market. The total acreage planted in Indiana peaked in 1997 at 3,600 acres. In that year the total production was 455,000 cwt with an average income of $16.00 per cwt. The total farm value of production was $7,280,000 ($2,022 per acre). Yield has increased since 1997 from 130 cwt per acre to more than 200 cwt per acre in 2014. 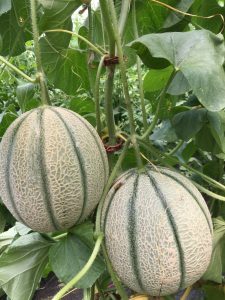 The Indiana melon growers have lost a significant share of the melon market since the 2011 and 2012 food borne illness outbreaks. Compared to 2011, the acreage planted and production in 2015 decreased by 900 acres and 52% (300,000 cwt), respectively. Harvest Season: June – Sept.
-USDA National Agriculture Statistics Service. The decrease in acreage and market share, and the associated risk of food borne illness made me think of possible solutions that can be used to increase farm income and market share for Indiana growers. During the past summer I initiated research that aims to diversify the product range of Indiana melon growers (Figure 1). 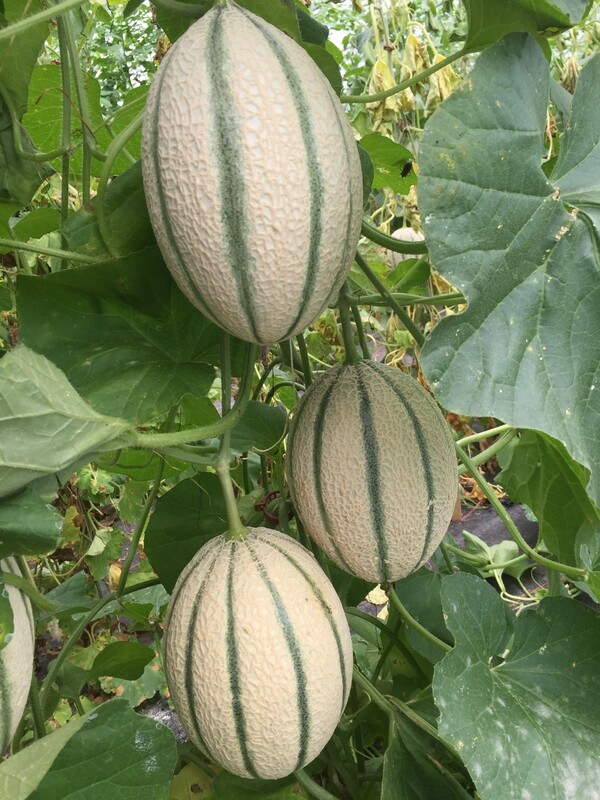 All research activities are focused on the development of a unique market segment for Indiana melon growers, targeting the development of a market that requires smaller fruit (personalized melons) of very high quality. 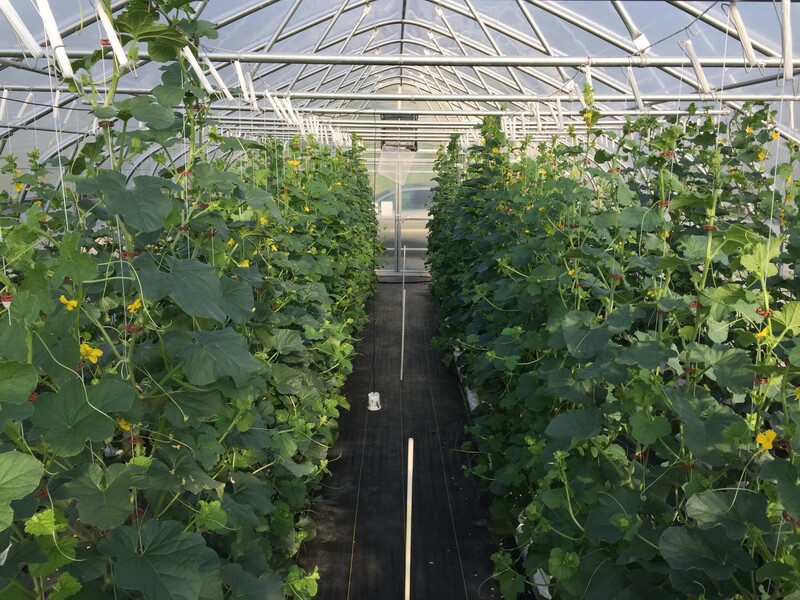 The research will demonstrate that through the use of high tunnels or greenhouses growers will be able to get melons earlier on the market and increase yield while keeping quality undeniably high. 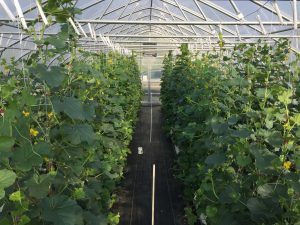 Initially the research will focus on variety evaluations in soil or soilless production systems in high tunnels, where the plants are trellised vertically (Figure 2). Growing melons vertically has been done very successfully in Spain, South Africa and other parts of the world. Between 1998 and 2008 Dr. Daniel Cantliffe and other collaborators from University of Florida also looked into the vertical production of Galia-type melons in passive ventilated greenhouses in North-Central Florida. 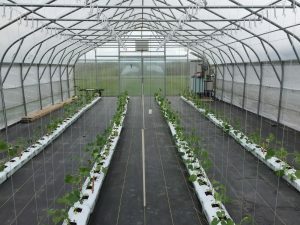 The research will aim to establish the best production practices for high tunnel and greenhouse growers in Indiana. It will also look at the suitability of other melon types i.e. Charentais, Italian netted, fully netted cantaloupe’s and sutured cantaloupes. Important criteria for variety selection include (1) high brix, good color, flavor and firmness; (2) fruit with exceptional nutritional value; (3) long shelf life (transport well) and (4) weight in the range of 2–4 lbs. Furthermore, an agricultural production economist will do a complete life cycle analysis to determine the profitability of the proposed production system. During May 2016 trials were planted at the HLA Plant Growth Facility on campus (greenhouse), at Meig’s Farm which is part of the Throckmorton Purdue Agriculture Center (high tunnel), and at the Purdue Student farm (high tunnel). Enza Zaden provided germplasm for the variety trial. Eight varieties, of which six have never been grown in the U.S. before, are being evaluated (Figure 3 and 4). On campus and at Meig’s plants were grown with hydroponic techniques in soilless medium culture using coconut coir as substrate. At the Student Farm plants were grown in the soil. Plant, yield and quality data were collected and are now being analyzed. Several issues were encountered throughout the growing season of which powdery mildew and bacterial wilt were the biggest challenges. I will share some of the preliminary results of the trials in forthcoming issues.